This is a really interesting episode of This American Life with an excerpt from The Agony and the Ecstasy of Steve Jobs. If you haven't already heard it, definitely give it a listen. We should all know the back story of our ubiquitousness Apple products. 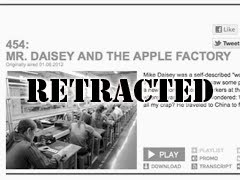 Mike Daisey lied about much of the information in his monologue. This American Life has retracted the entire show. Ira Glass did the honorable thing and admitted they were wrong and should have never aired the above episode. The Retracted show is really intense and interesting. It's all really unfortunate because Mike Daisey could have still made his point by saying his show was a work of fiction. He got greedy and wanted journalistic credit too.